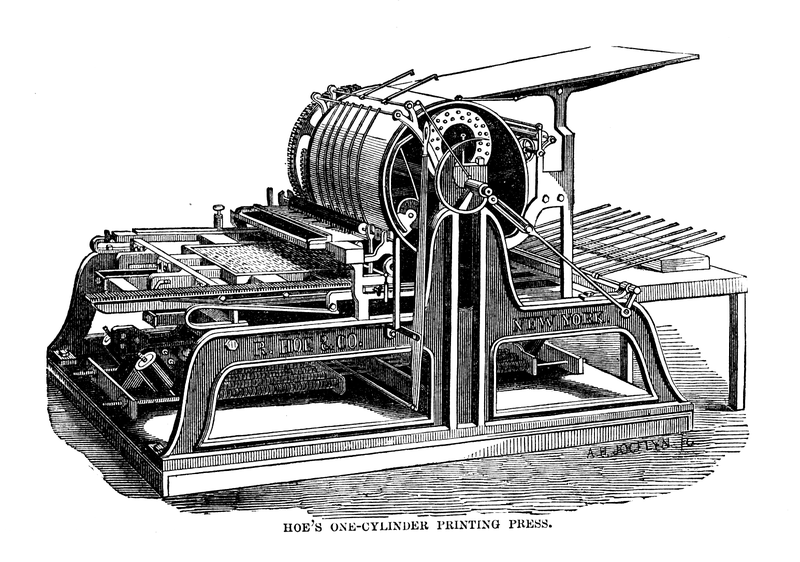 The newspaper business was highly variable in the nineteenth century (in different ways than it is in the 21st century). Changes in editorship, political affiliation, and even location were frequent. Editorial changes were particularly significant, since very few editors maintained exactly the same newspaper that they inherited from a predecessor. Editors came and went quite often, passing on the “scissors and the quill,” in the words of the outgoing editor of the Polynesian, Edwin O. Hall. Editors came to the profession through varied means. Many editors started out in other roles in the newspaper office. For instance, Charles C. Langston was a typesetter for 13 years at the Anderson Intelligencer before he became editor. Preston B. Plumb worked as a press foreman before becoming the editor of the Kansas News. In a less noble example of editorship coming out of a newspaper job, John O’Brien started the Loudon Free Press after being kicked off the staff of Brownlow’s Knoxville Whig for embezzlement. Others did not have such a traditional path: William Wallach, for instance, was a civil engineer who did surveys in Texas and Colorado before editing the Washington, DC, Evening Star. And one of the most famous editors in the antebellum United States was William G. Brownlow, or Parson Brownlow, so called because he was a circuit-riding Methodist preacher before editing his own newspaper. Many newspaper editors treated their papers as a step toward another profession (often politics), and so they abandoned their papers for political appointments. One of the more famous of these was Clement Vallandigham, who left the Dayton Daily Empire to become the leader of the Copperhead faction of the Democratic Party. Another was Joel Asper, who edited both the Western Reserve Chronicle and the Jeffersonian Democrat before turning to politics. The Civil War also wreaked havoc on newspapers and their editors, many of whom joined up with their local military units. Among the newspapers affected by the war were the Anderson Intelligencer, Louisiana Democrat, and possibly the Carrollton Sun. Most editors did not come back to their newspapers after the war, even if they survived. Even editors who were not part of the war could be affected by individual violence. The editor of the Nashville Union and American, George Poindexter, was murdered by a rival editor in 1859. John Frederick Bollmeyer, editor of the Copperhead Dayton Daily Empire, was murdered in 1862 by an angry Republican. In 1858, Oliver Willett, editor of the Freeman’s Champion, was suspected of the robbery of a rival politician’s business, whereupon he was immediately removed as editor of the newspaper. Sometimes it’s very difficult to track down exactly when an editor began or ended his tenure. If newspaper copies are not extant, we have to rely on other sources, such as Rowell’s or Ayer’s newspaper directories, to tell us about who the editor is in any given year (and the accuracy of these directories is somewhat suspect; for instance, Rowell’s of 1887 lists Sam P. Ivins as the editor of the Athens Post, but Ivins died in 1884). Unfortunately, these directories are available only for years after the Civil War. Sometimes the editor’s name does not appear on newspapers that are extant. Nevertheless, editors who served for more than a few years often became fixtures enough in their communities to appear in later histories of their town or county. By culling together information from all these different sources, we can get a decent idea of the length of editors’ tenure. 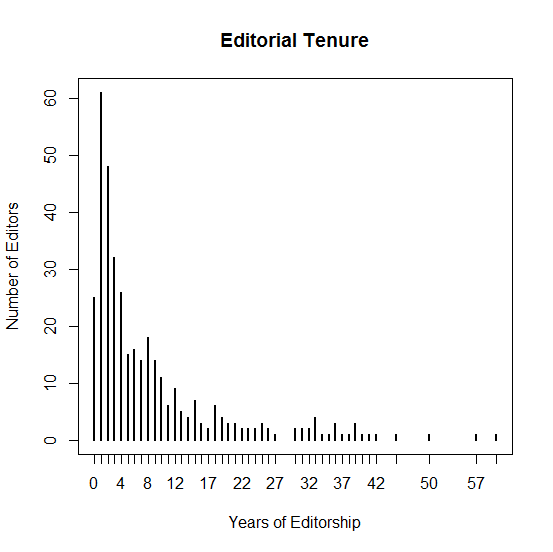 Here are a few interesting facts about editorial tenure that we can see from this data set and chart. Most editors were in and out in under five years. The mode length is a mere one year. Nevertheless, some editors made this profession their life. The outliers (Theodore Schoch, for instance, who edited the Jeffersonian Republican for an astonishing 60+ years!) bring the average to 8.224 years. The data set is, of course, incomplete. We don’t even have editorial data for all of our newspapers from Chronicling America, and Chronicling America is only a fraction of the papers that were actually published in the 19th century. But I think that the sample is as representative as it’s possible to have. The data shows that the newspaper trade was not for the faint of heart. Most men failed, or at least gave up, quickly. A few stuck it out and made the dissemination of news into their life’s work. But they all tell compelling stories of the entrepreneurial spirit of the nineteenth-century United States.